To improve the quality of your tomato crop next year, save seed from one or two plants that have cropped well for you this year because these seeds will be from plants that have already adapted to your local growing conditions. It is easy to save tomato seed from plants that were grown from open-pollinated seed. Hybrid seeds are unreliable because seed from hybrid varieties can be sterile, or revert to the traits of only one of the parent plants. A wide range of open-pollinated seed for tomatoes is available, with varieties to suit all Australian and New Zealand climate zones. You can order them by mail on the internet from companies including Greenpatch Seeds, Green Harvest or Eden Seeds. To save tomato seed, first select one or two fully ripe tomatoes that you would like to grow next year. For medium to large tomatoes, one fruit is usually enough for the home gardener. For best results, keep them at room temperature until they are just beginning to get soft. 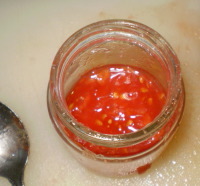 Then cut the tomato into segments and use a teaspoon to transfer the seeds and their surrounding jelly into a clean glass jar. For Italian type tomatoes that don’t contain a lot of jelly, you can add a very small amount of water to keep the seeds moist, but don’t drown them. Leave the jar undisturbed in a warm place, out of direct sunlight, where you can observe fermentation. Within two or three days a foamy mould will form on the surface of the tomato mixture and it will look as though something has gone horribly wrong. Don’t worry. This is a beneficial fermentation process that kills off several diseases that can affect tomato plants, but the mould can cause premature germination of the seed, if it is left too long. As soon as the thick foam forms, scoop it off and fill the jar will clean water. Viable seed sinks to the bottom of the jar. Carefully pour off loose jelly floating at the top of the jar, then pour the jar contents into a sieve. Wash the seeds thoroughly in the sieve to remove all the jelly, then tip the seeds onto a sheet of smooth paper. Avoid using paper towels for tomato seeds because they are hairy and difficult to remove from absorbent paper. Allow the seed to dry for thoroughly, indoors. After they have been drying for a few hours it is easy to rub them between your hands to separate any clumps of seed. I usually leave them to dry for a week before packaging in a paper envelope and storing in a biscuit tin in a cool place, until they are needed. This entry was posted in Saving seed and tagged Aussie gardening, Australian gardening, environmentally friendly gardening, flowers, fruit, garden soil, growing plants, Healthy soil, Herbs, how to grow, Moon Planting diary, organic gardening, plants, propagating, saving, seed, sustainable gardening, tomato, vegetables. Bookmark the permalink. Thanks for this information. I’ve just started drying the seeds. Looking forward to seeing how this all plays out. I found your site to be a breath of fresh air. Its been a great read and very informative to say the least. I came to your site to read your article about saving your tomato seed. I got very unwell a few months ago, making my way back health wise, and have taken to growing tomatoes and other great veggies to enhance my families health. I’m loving the natural high I’m getting from gardening these vegetables and it is making a very big impact on my over all health raising the seedlings from seed and watching the little guys grow. Its been a life saver to me, and I’d like to thank you very much for posting some great information for everyone to read and try. I have used this tomato seed saving method for four years after I first discovered it on this site in 2010. This has been most successful and this season I have huge “Mortgage Lifter” tomatoes that I originally purchased from Diggers Club some years ago. The roma and cherry/grape varieties have also responded well to this method. Thank you for the great advice on the website. Mary. Do you sell any tomato seeds of the older varieties such as KY1 or Burwood Wonder. I would like to buy some for 2016/7 season, if possible. Can you help?